Mr. Barnes called her a gift that is still with him, before becoming overwhelmed. “I cried for days. I stayed away for days. ... Just praise the Lord,” he said. “She wasn’t only my daughter and my baby and my angel. She’s all of our daughter, everybody ... ,” Mr. Cevilla stated. “This is a country that is violent. It was violent in its birth, the way it came into being. It has sustained itself through violence, and it continues to indulge in violence,” Dr. Ava Muhammad stated. Violence is actually honored and given a high place in American society, as exampled by the games and recreation her citizens engage in, she noted. “People who are desirous of a peaceful, righteous existence are going to have no choice but to go form their own safe haven,” Dr. Ava Muhammad said. Based off a tip, Harris County Sheriffs arrested the alleged driver of the vehicle, 20-year-old Eric Black, Jr. on January 5. Authorities state he admitted to his role in the killing. That same day, police arrested 24-year-old Larry Woodruffe, the alleged shooter, who was initially booked into county jail on a felony drug possession charge, police say. Sheriff Gonzalez stated police received a tip from journalist Shaun King. Mr. King and civil rights Attorney Lee Merritt raised and offered a $100,000 reward to help find the killer. The arrests came on the same day that local activist Deric Muhammad and Pastor E.A. Deckard spearheaded a rally to organize the community to find the killer. “The momentum to find Jazmine’s killer was created by the people,” said Deric Muhammad. Police alleged that according to Mr. Black, the shooting was in retaliation for an altercation the pair had with some men at a nightclub, but it was a case of mistaken identity. 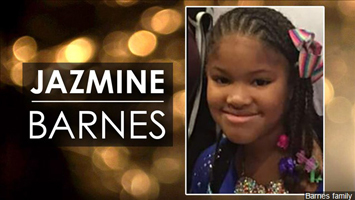 “The way that the case of Jazmine Barnes’ murder unraveled should not impact us at all if we’re truly interested in the pursuit of justice,” the Muslim activist stated. “We made a judgement call that this was possibly a race-related murder based upon the information given to us by the family, eyewitnesses, and this was also information vetted by the Harris County Sheriff’s Department,” said Deric Muhammad. “Without truth, we cannot arrive at justice, so I don’t think this should damage at all our movement to get justice for our people. If anything, we should be grateful that if, and I use the term if, if these are the young men that are responsible for taking Jazmine’s life, we should be encouraged that they have been brought to justice,” he stated. The tragedy speaks to the need for the Black community to step up and make where they live safe for not only children, but also adults, said Attorney Nana Gyamfi, founder of Justice Warriors for Black Lives. It is a collaborative network of attorneys, legal workers, non-legal workers working with the community to provide workshops, training, policy development, and legal services in support of current Black liberation movements. “I’m hoping that as we are talking more about the ways that we can protect our communities, and in particular Black girls, that we do more than talk and that we begin to engage in action,” she stated. As for some peoples expressed skepticism of an arrest of two Black men in the aftermath of a description of a White suspect, Atty. Gyamfi said people should be skeptical. “I’m not one to trust the police, as a defense attorney that has represented plenty of people who the police said were responsible for crimes or for harm who it turned out that they clearly were not responsible for harm,” she stated. Dr. Ava Muhammad concurred. “You never get complete information when it comes to criminal investigations, and I think people have a right to be skeptical,” she said. “What else could we be when this much time has lapsed and there’s a complete reversal and dramatic change in the information? And we’ve seen this happen over and over again, and that’s why my position just has to be the tragedy itself, however it happened, it says to me that America is not a safe place to live,” said Dr. Ava Muhammad.